This review originally appeared on Fat Quarter on 25 November 2009.
my mates talking race, class and gender. Treading a brilliant line between the tender and the gutsy, Into Temptation is split into three sections: Mad Love, No Angels and Ordinary Joys. It has a wealth of experience in life and love, a devil-may-care attitude which glows through the collection, and an anger directed in all the right places. I’d challenge anyone to not fall a little bit in love with this book. amuses me, bruises me, screws and confounds me. that face above me like a figurehead. Singing out from this collection is an epic personality. The type whose quips should be immortalised in amongst the quotes from Noel Coward, Dorothy Parker and Mae West. Calling all smart bookish girls aged seventeen or under: throw away your Frieda Kahlo postcards and your dreary Sylvia Plath: I’ve found someone better. All those of drinking age – catch her at a poetry night sometime soon. 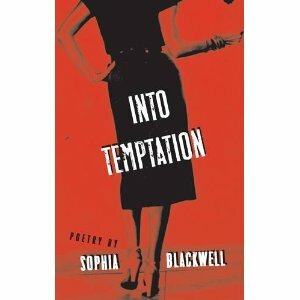 Posted in Arts, Blog, Book reviews, Feminism, ReviewsTagged book review, if they taught poetry like this in schools I wouldn't get teased for being a poet I'd get worshipped instead, Into Temptation, poetry, queer poetry, Sophia BlackwellBookmark the permalink.